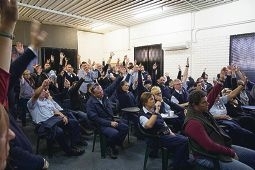 Youth custodial officers at their recent stop work meeting. The officers want cowling installed and commissioned on all internal fencing. They also want suitable air-conditioning installed to all accommodation areas to alleviate the need for portable fans and a third permanent recovery team introduced regardless of the detainee population. Damage to Banksia Hill Detention Centre is being addressed after a riot in January. Community and Public Sector Union/Civil Service Association acting branch secretary Rikki Hendon said ongoing negotiations with the department had been done in good faith until recently. ‘They are pretty angry the department has set a date when some of the major issues have not been addressed,’ she said. Ms Hendon said without the cowling, detainees could scale the fences within 30 seconds, making them ineffective. The union also hit out at plans to recruit prison officers from adult prisons to engage in youth custodial work on an ad hoc basis. A spokesman for the Department of Corrective Services said discussions were continuing in regards to recovery teams and relevant issues. Additional security upgrades will not be completed until the end of next month. Shortages of youth custodial officers are being experienced predominantly because of absenteeism due to workers’ compensation and personal leave. ‘DCS is continuing to support those on workers’ compensation leave to return to work and has commenced a program to recruit and graduate 50 Youth Custodial Officers,’ the spokesman said. Consistent staff shortages lead to longer lock-down periods.